Jute rugs are ideal for those areas where luxury is a necessity such as sitting rooms and bedrooms. Jute displays a soft natural lustre that brings a bright, relaxed feel to any modern environment. Jute rugs and runners from The Natural Rug Store are bespoke and prices are based on your rugs configuration. To design your own no-obligation Jute rug or runner please visit our Rug Builder or browse our collections below. 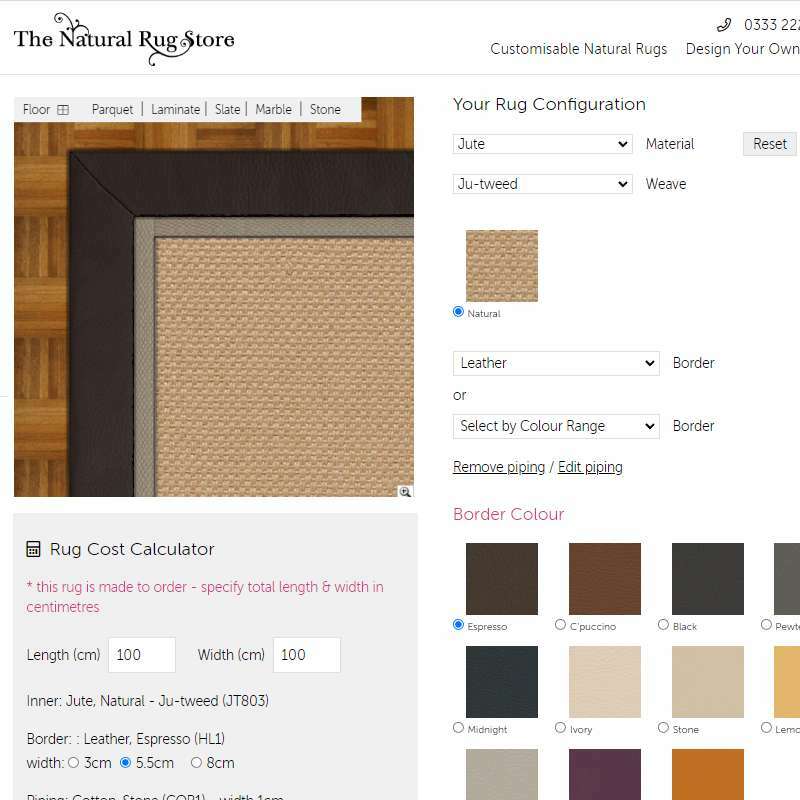 Use the Rug Builder to design your own superior quality Jute rug or runner. Create and save as many rug designs as you wish, and when you're completely satisfied, buy securely online! Jute the finest jute is grown on the fertile plains of the Ganges Delta and is one of the softest natural fibres. This hot, humid region lies mostly in Bangladesh and provides the perfect conditions for jute to flower. At the end of the growing season the plants are harvested by hand and the stalks soaked in water for up to twenty days. This careful process allows the long strands of jute fibre to be separated in tact and then hung to dry naturally in the warmth of the sun. Known for their silky lustre, jute fibres can be spun into a smooth yarn that is soft to the touch but that wears well once it is woven into a design, making it ideal for home furnishings and floor coverings. As with all natural fibres Jute is unsuitable for use in any areas where high moisture levels are likely due to water spillages leaving water marks. Jute is one of our most light reflecting materials. To compare jute against our other natural materials please see our Suitability section.